Having achieved everything they wanted to with 2016's seething The Raging Tides, the record "perfectly signaled that we are now truly here to stay and that we are not going away like we did in the 80s after the release our first two records. At the same time, it was a clear progression songwriting-wise, as well as the production, presenting the tightest version of Exumer up to that date." A successful touring campaign further fired them up, but they were soon eager to get back to writing. 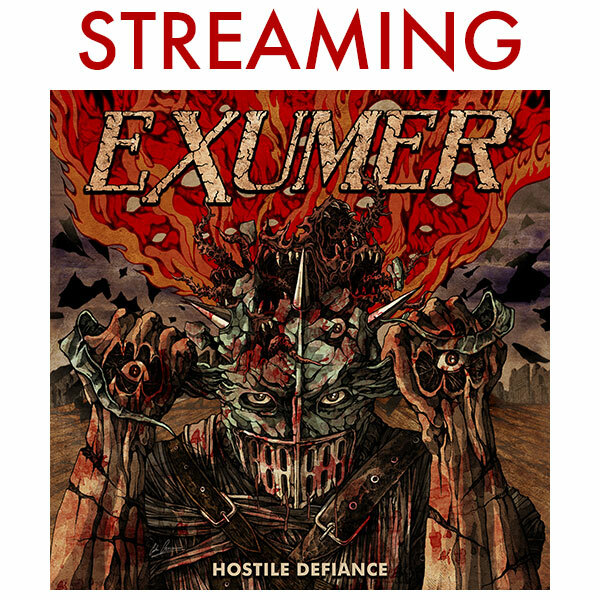 With no interest in repeating themselves or treading water, Exumer always set out to create a record that is not only better but also markedly different to that which preceded it, something borne out when comparing 2012's Fire And Damnation - their return after a 25-year hiatus - and The Raging Tides. As strong as those records were, neither compare to the tightness, depth and diversity of Hostile Defiance, Von Stein proudly proclaiming the record to be their Master Of Puppets or Reign In Blood. "I think that the vocal and musical melodies will surprise our fans very pleasantly because they add density to the music, making it overall a lot more accessible. At the same time we haven't lost any of our aggression or energy. To the contrary, Hostile Defiance is a brutal sonic attack from start to finish." The biggest hurdle the band had to overcome in composing this opus is their geographical division, lacking the luxury of working together whenever they want to because half the band reside in Germany and the other in New York. "We started working on the new album in the summer of 2017, and it was winter 2017 when we met for sessions in the rehearsal room. We then rented a rehearsal studio for an entire week in the spring of 2018 and finished all the details during the following summer. Whenever we met for tours or shows we worked on stuff on the days prior to playing live." That the result is so accomplished and in no way sounds like it was rushed is testament to the skills of those involved, and the magic that happens when Exumer get together even for short periods. With the opening title track they make their intent very clear, the song a rush of adrenaline and anger, while the likes of "Dust Eater" and "The Order Of Shadows" slow things down some without losing any of their bite, holding the listener tightly by the throat and demanding their attention. The melodies, while far more palpable than on any previous releases, also do not pander or sound calculated, all of them very much fitting within the framework of the individual song and helping to create a variety of moods. Likewise, Von Stein's intelligent lyrics leap out, making the listener think. "Each song features a story around a form of mental illness and its manifestation there of. I try to keep the conversation about mental illness going without casting any stigmas or clichés. I am a firm believer that the more we accept and normalize mental illness like any other malady - heart disease, diabetes or hypertension - we can remove the stigma around it and make people more comfortable/accepting of unmet mental health needs and the need for treatment." Accordingly, "Raptor" discusses depression and how it makes an individual feel, going through varied degrees of sadness, isolation and lethargy, while "Trapper" is about symptoms of schizophrenia and how the protagonist suffers from hallucinations, with images of demons and driving him to submit/succumb to the illness. These themes are also tied into the artwork of the record, with the band's masked mascot trying to get out of a straight jacket after burning down a city behind him, and "Carnage Rider" tells this story, "which is about mania and how the protagonist goes on a spree of destruction without being regulated via medication." Furthermore, the album is timely, since the subject of mental illness is "front and center with each mass shooting in the States. It's a reoccurring topic in social life and needs to be addressed and understood correctly, without stigma or any negative connotation." 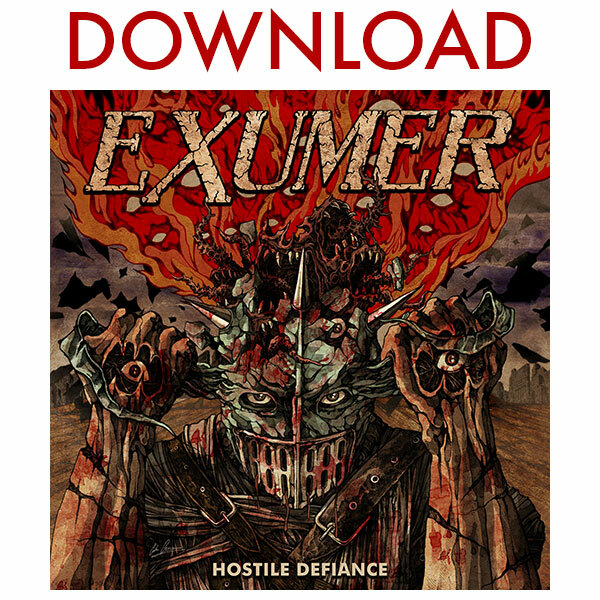 Hostile Defiance marks Exumer's third time working with producer Dennis Koehne (Sodom, Melechesh), tracking the album in studios in Dortmund and Frankfurt, and the sessions were marked with "super positive vibes all around with a strong, driven work ethic to create an optimal product." The band plans to tour the record hard, and will be hitting the road in Europe when the album drops, and from that point onward they will be visiting as many countries as possible. "Our goal is simple: to further establish the band as one of the main German thrash metal acts that began in the 1980s and are now carrying the torch into the 2020s."